Urban areas contain a wide variety of open spaces, yet much of this has evolved under the pressures of human population with minimal management. The last 40 years have seen problems of varying severity begin to appear, including contamination, erosion, acidification and compaction. These problems have brought attention to the importance of the soil cover, the need for better understanding it, and the need for its protection. This book is a review of state-of-the-art science for soil in urban areas. Based on a meeting organized by the Nature Conservancy Council and the British Society of Soil Science, the nine chapters cover soil classification, contamination by waste and metals, physical and biological properties, nutrient provision and cycling, vegetation, and soil storage. The book provides a basis from which to plan future research and development programs. 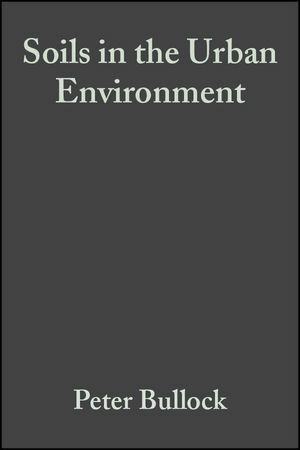 Peter Bullock and Peter J. Gregory are the authors of Soils in the Urban Environment, published by Wiley. Soils: A Neglected Resource In Urban Areas. The Classification Of Soils In Urban Areas. Waste Material In Urban Soils. Metal Contamination Of Soils In Urban Areas. Physical Properties Of Soils In Urban Areas. Nutrient Provision And Cycling In Soils In Urban Areas. The Biology Of Soils In Urban Areas. Soils And Vegetation In Urban Areas.